Home » Website Building » SEO » What is Black Hat SEO? 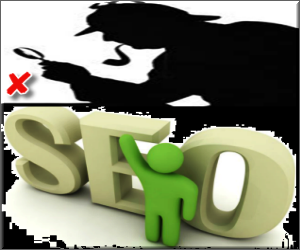 Black hat SEO is the techniques followed by webmasters to trick search engines in order to improve their site’s position in search results pages. Site building is an art which needs lot of dedication and investment of time and money. Unfortunately webmasters are trapped by the attractive advertisements and online money making programs and thinking of converting their site into a money making machine without much effort. Ultimately they try to get more organic search traffic from search engines within short span and started following black hat SEO techniques to cheat search engines. The final result is well known – smart search engines like Google having more than 60% search engine’s market share will ban and delist the site completely from search results. Though webmasters have an option of raising reconsideration request after flagging for manual spam it will be too late to realize and in most of the cases the site will never appear again in searches. Stuffing of highly paid keywords will not improve your site’s rank rather will result in banning your site from the search results. It is difficult to define the limit for using any particular word in the content but repeatedly using the same word will ensure users and search engines will punish your site. Search engines rely on alternate text for identifying images and flash content. Providing irrelevant alt text for images will lead search engines to understand the images differently and results in showing the images in irrelevant search results. The most and simple way cheating user is to use hidden text or image, for example using white color font on white background. Search engines can still read the hidden content and the moment the crawler realizes your trick you will receive a message from your webmaster tools account that your site is flagged for manual spam action. Using irrelevant meta description leads to display misleading information in search results and showing some other content inside the page. Though search engines will show any piece of information from that page which it feels more relevant to the topic, it is necessary to provide appropriate meta description. Cloaking is another ways of showing different content to search engine crawler and real human users. Each search engine crawler has a name for example Googlebot is the web crawler for Google. It is technically possible to provide different content when Googlebot crawls a page and user opens the same page from search results. Duplicate and copied content are the simple and foremost reason for the search engines to ban most of the sites in the web. Site owners can definitely analyze the design of other sites and not the content. Browsers have option to view the source code and inspect each element on a webpage to help webmasters to learn web design and troubleshoot. But copying the content or image is nothing but grabbing other’s hard work which is not acceptable to search engines. Moreover the content owner can also take appropriate action on infringement. Since the time search engines started weighing link popularity there were many bogus SEO companies offering paid link building for sites. Paid links or using traffic exchange programs are considered as violation of webmaster guidelines and your site will be marked for manual spam action. Spamming other’s site with irrelevant comment is another way of black hat technique. It is a common practice among webmasters to use famous trademarks to drive traffic. For example, there are domains with as many as variants of the word AdSense. Most of the webmasters do not even know that they can’t use AdSense on such URLs due to trademark violation. Well, there is only one conclusion – be honest and follow the webmasters guidelines which will yield good returns in long term. Build your site for users and not for search engines. It will take years for any site to get better position in search results. It is a very simple task for search engines to find your black hat techniques. Today or tomorrow but for sure your site will be punished for following black hat techniques. Try doing things on your own slowly and steadily without falling prey to cheaters. More than 80% site on the web are fake or not maintained properly and just following the guidelines will ensure your site will be part of the rest successful 20%. as per algos are getting strict and don’t crawl spammy links, do you think black hat ranking still works? as per my observation SEO is getting shorter (location wise) and people become smarter with finding tips and tricks of google algos , Google’s algo has loopholes and if wisely used we get rank faster with the lesser resource. So these tips count in black hats?